Samantha Cameron, the British Prime Minister’s wife and a mother of three, travelled to Lebanon on Tuesday for a barefoot visit to a Syrian refugee camp as an ambassador for Save the Children. 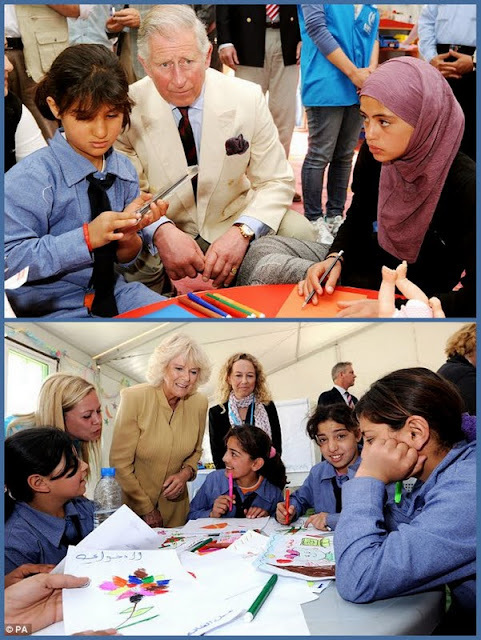 Two weeks before, the Prince of Wales and the Duchess of Cornwall visited a Syrian refugee camp in Jordan. Prince Charles has since made significant donations to the British Red Cross Syria Crisis and the Disasters Emergency Committee (DEC) appeals. The Daily Mail gave extensive coverage to both visits. Barefoot and sitting cross-legged on the floor, Samantha Cameron is listening to mothers telling stories about their children. After visiting refugees, the woman who rarely makes public pronouncements warned that innocent childhoods were “being smashed to pieces” in the conflict. Mrs. Cameron said, “As a mother, it is horrifying to hear the harrowing stories from the children I met today. No child should ever experience what they have. Mrs. Cameron, who has been an ambassador for Save the Children since 2011, visited a camp in the Bekaa Valley on Tuesday and spoke to women and children caught up in the violence. Visibly emotional after speaking to a mother whose young son was killed by a sniper in front of her other six children, she said, ‘It’s so shocking. It’s difficult to take in. The grieving mother had told Mrs. Cameron, “I was driving with my children, trying to escape Syria, when the shooting started. How can anyone shoot at a car with seven children in it? At a health clinic at the camp, Mrs. Cameron held the hand of a little disabled boy. Because of constant shelling and sniper fire, his mother struggles to find healthcare for him. An estimated three million people have fled their homes in Syria. One million have made it to neighboring countries but two million are trapped in the warzone. As they picked their way through the dust and rubble, the shock on their faces was evident. Prince Charles and the Duchess of Cornwall (March 13) visited a refugee camp in Jordan for men, women and children fleeing the brutalities of civil war in Syria. Just seven miles south of the border at Ramtha, King Abdullah Park is home to almost a thousand desperate and displaced, more than half of which are children. The Prince and the Duchess first stopped at a Portacabin where half a dozen women were knitting and making handicrafts, which will be sold to raise funds for the refugees. Despite not having a common language, Camilla immediately bonded with the ladies as she gave them a thumb up, prompting them to laugh and smile. 'Have you always knitted?' she asked through a translator. One woman told her that she had been in the camp with her children for seven months, another for a year and a half. The Duchess listened intently and admired their handicrafts. Afterwards she told the Mail, “Some of their stories are so harrowing but what I find so remarkable is their strength of spirit and the way they are so cheerful despite their circumstances. “I think that is women for you. They have got their children to look after. They have to survive. The couple was then introduced to Na’eem, 55, who fled his home in Della with his wife and five children aged between 22 and six last July. Na’eem told the prince how he was twice imprisoned and tortured by Syrian forces -- once for two and a half months -- for writing anti-government poetry. He had cigarettes and cigars stubbed out on his body, the scars of which were still visible. …The couple also spent time in a children's area where youngsters are encouraged to deal with the trauma of what they have seen by drawing. Many of the childish scribbles horrifically depict guns and dead bodies. Her words clearly moved the prince, who said afterwards: “Many of these children have been traumatized by the terrors they have witnessed before they came here. “Some of them have lost their parents and had horrendous experiences and it is remarkable what all these wonderful NGOS are doing to deal with this unbelievably heartbreaking situation. “I think the thing that has come out of this is just how unbelievable generous the Jordanian people are, who are truly remarkable. …Sava Mobaslat, 41, the program director for Save the Children in Jordan, said the 600 children at the camp are bussed to local schools to continue their education but go to the children’s center every day for therapy sessions. The children are encouraged to draw what they have seen, because they often do not have the vocabulary to express their feelings and experiences. Mobaslat said, “We use drawing, drama, music and arts as an alternative form of expression through which they can express their anxiety and frustration to help them get over it. “They draw guns, bodies, a lot of red to begin with and gradually they go back to drawing the garden in their backyard. “The timeframe for their recovery varies from child to child, it takes longer for someone who has witnessed the death of a parent or sibling. We have one girl who was walking to school and saw it bombed with her siblings inside and it took her a long time to get over that image. “Today they are drawing nice images from home, something from their past they can link to their future.